發煙點是油品加熱時，開始冒煙的溫度。此時油品會開始氧化和變質，對人體健康有不良影響。發煙點愈低，愈不適合高溫油炸。 The smoke point is the temperature that started smoking when heating oil. The oil begins to oxidative rancidity. It is bad for human body. The lower smoke point is the less suitable for frying. 酸價是中和1g油脂中所含游離脂肪酸所需之氫氧化鉀的毫克數。CNS國家標準酸價標準為4 mg KOH/g以下。酸價愈低，油脂品質愈好。The acid value is the numbers of mg KOH/g to neutralize the free fatty acids in 1 g oil. The acid value standard of CNS is below 4 mg KOH/g. The lower acid value is the higher oil quality. ω-9單元不飽和脂肪酸表示脂肪酸只含有一個不飽和鍵，油酸(oleic acid) 為C18:1。其油品抗氧化、耐高溫、穩定性高，適於煎、煮、炒、炸一般料理方法，如茶花籽油。ω-9單元不飽和脂肪酸愈高，油品穩定性愈高。 ω-9 Mono Unsaturated Fatty Acid (MUFA) only has one unsaturated bond in the fatty acid. Oleic acid is C18:1. 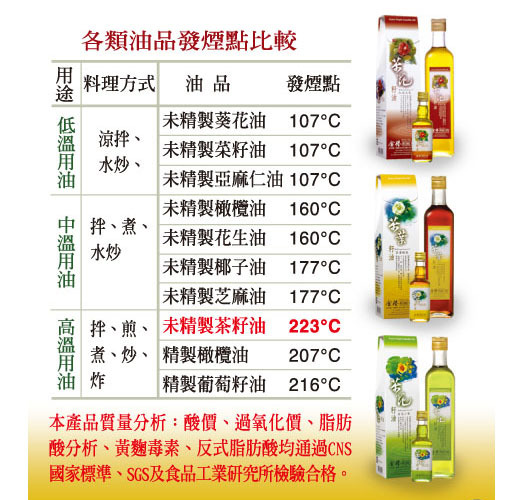 This kind of oils is antioxidant, high stable and resisting high temperature, such as camellia seeds oil. It is suitable for the general cooking methods. The more ω-9 Mono Unsaturated Fatty Acid (MUFA) has, the higher oil stability is.